FILE - Faiez Mustafa Serraj, President of the Presidency Council of the Government of National Accord of Libya (L), is greeted by Italian Interior Minister Marco Minniti during a meeting in Rome, Italy, March 20, 2017. France and Italy wrangled on Thursday over how best to tackle renewed conflict in Libya as a bid by eastern forces under Khalifa Haftar to seize Tripoli stalled in the face of strong resistance on the capital's southern outskirts. 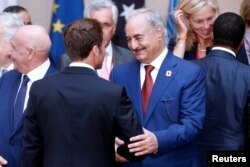 FILE - Khalifa Haftar, the military commander who dominates eastern Libya, shakes hands with French President Emmanuel Macron in Paris, France, May 29, 2018.